Wandering Arlington National Cemetery’s back regions, I came across a grave that just struck me. Socrates Hoffin – sounded like a cool name. Figured I’d look him up. And there began the journey. 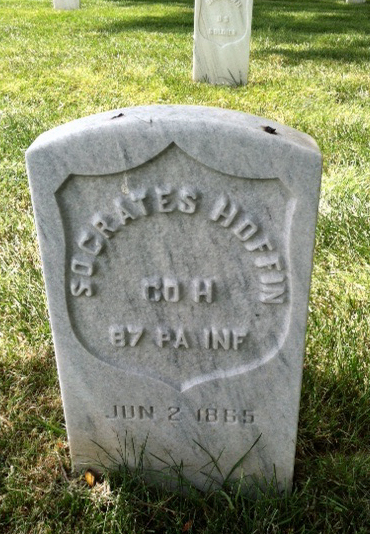 After searching military records that list him as Hoffin, I finally found his real name was Hofius when researching on ancestry.com. I later confirmed it on the regiment’s muster rolls. The saddest part – he was in the army only three months at the end of the Civil War and died shortly before its conclusion. A miner born in Hickory, Pa. on March 16, 1842 to farmer George Hofius, Socrates enlisted in the 87th Pennsylvania Infantry, Company H on March 13, 1865. The private was killed June 2, 1865. Records say the 87th fought several battles in Northern Virginia while Hofius was with them, but nothing on June 2. The regiment lost 202 men during its four years with 90 killed in battle and 112 dying from disease. This entry was posted in Arlington National Cemetery and tagged 8th Pennsylvania, Arlington National Cemetery, Best Arlington National Cemetery walking tours, Company H, Photo by Rick Snider, Socrates Hoffin, socrates Hofius. Bookmark the permalink.